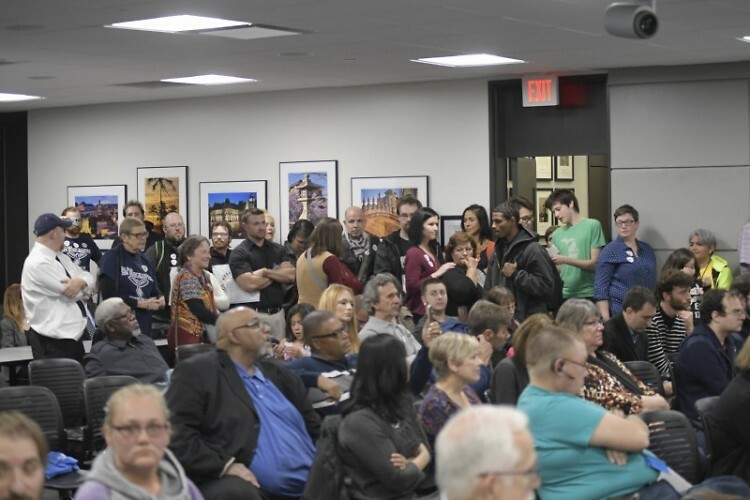 Citizens packed the Grand Rapids City Commission meeting Tuesday night, October 24, 2017, to speak on two prominent issues affecting our city: The Rapid’s ongoing labor dispute with the ATU (Amalgamated Transit Union), and the need for the Commission to pass an official Equal Protection Policy regarding immigrant rights in the city. While on the surface it may seem that these two issues are unrelated, the 52 men, women, and children who spoke in solidarity last night made it clear that they are. With ‘No Intimidation’ banners stuck to their shirts, clad in ‘Equal Service’ and ‘Do Better’ stickers, citizens stood in line awaiting their turn at the microphone. And one after another, for two and a half hours, they expressed their support for both the ATU’s pursuit of a new contract, and an official policy protecting immigrant rights. “Immigrant rights are worker rights,” Gema Lowe, of The Workers Center of West Michigan, said emphatically. It was a statement and theme that would be repeated throughout the meeting. Lowe went on to express her support of a fair contract for the ATU and discuss the potential economic impact of not protecting immigrants in our community. Citing statistics from a New American Economy study, she showed that in 2014 immigrants in the Grand Rapids area accounted for $3.6 million dollars in tax revenue and $1.1 billion in spending power. “If we don’t protect immigrants this funding in our community will go away,” she said. 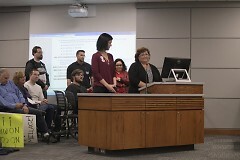 Others, like Sergio Cira-Reyes, courageously discussed their life experiences and explained how these perspectives inspired them to stand before the Commission in support of an Equal Protection Policy. With his young daughter by his side, Cira-Reyes talked about coming to the United States at nine years old and how his parents were deported when he was just 15. He said this left him constantly looking over his shoulder thinking he could be next. Lowe, Cira-Reyes, and many others who attended the meeting were there in support of Movimiento Cosecha Grand Rapids (Harvest Movement). 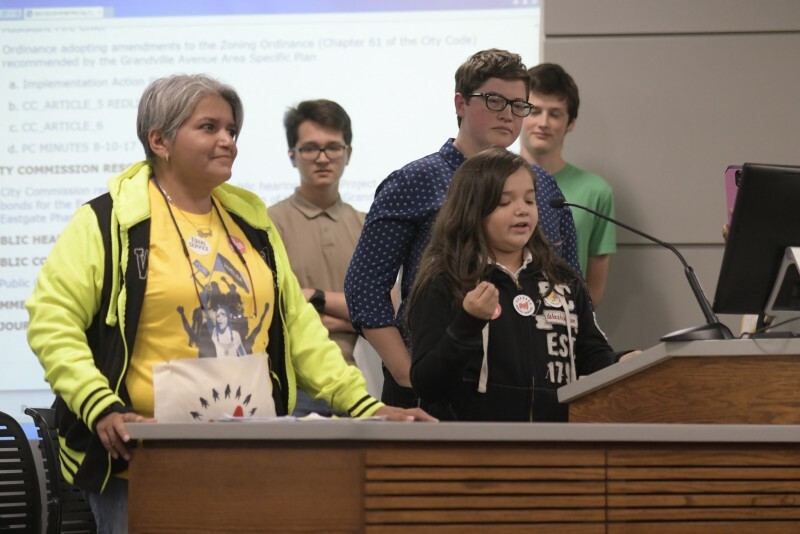 Cosecha GR, along with The Micah Center, have been pressing the Commission to pass an official Equal Protection Policy that would prohibit any city employee, including GRPD officers, from asking residents about their immigration status. While the City and GRPD have publicly stated that they do not ask questions pertaining to immigration status, members of the immigrant community have continued to reminded them that this is not good enough. That a promise is not a policy. And that without an official stance the underlying reality of fear, distrust, and intimidation in the immigrant community will continue. Some of the students that take those busses were at the meeting as well. Riley Wilson, Alex Van Kuiken, and Molly DeGraff all attend GRPS schools and depend on The Rapid for transportation there and back. While they spoke in support of an equal protection policy, they also took time to voice their concern that the contract dispute involving the ATU could soon lead to an interruption of bus service in the city. For over two years now Rapid bus drivers and mechanics have been working without a contract. While negotiations have started and stalled repeatedly within that time, the upcoming Rapid Millage Renewal on the November 7th ballot has rekindled a sense of urgency on the issue. The ATU has stated that if no new contract can be reached by November 7th, then they will encourage everyone to vote no on the Millage Renewal. Proponents argue that if the millage doesn’t pass The Rapid would lose 30-35 percent of its funding and could stand to lose another 30 percent of State matching funds. They say that if this loss of funding happens it could cripple public transportation in the greater Grand Rapids area. However this didn’t sway ATU members or citizens at Tuesdays’ meeting. They all spoke in solidarity just as they did regarding immigrant rights. They asked the commissioners, and the Mayor who’s a Rapid Board Member, to pressure the rest of the board to negotiate a fair contract. And they reiterated their stance that if there is no new contract there will be no new millage. As the meeting wound down retiree Jack Prince did a great job summarizing what had been a rather emotional evening. Though he didn’t plan on speaking he said he was moved after seeing and hearing what so many people had to say. It didn’t take long for one of those cries to be heard and answered. At the end of the meeting Commissioners Joe Jones and David Allen informed those still in attendance that the Equal Protection Policy will be up for vote on November 14th. For now it looks like the ATU and its members may have to wait until after November 7th to see if their cries will be answered as well. Committee of the Whole and City Commission Meetings are held at City Hall, 300 Monroe Ave NW on the 9th floor. A schedule of dates for the meetings can be found here. All meetings are open to the public and parking is free if you validate.